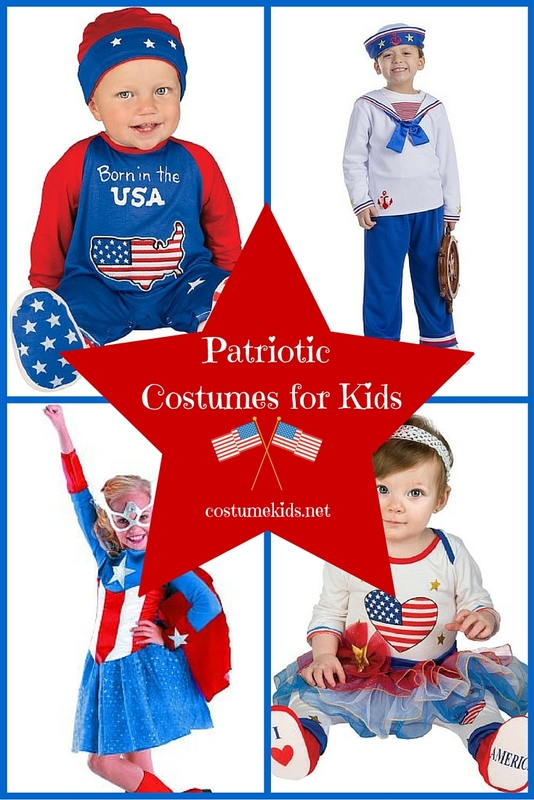 Patriotic costumes for kids are great to use for dress up fun, Halloween, Cosplay, the Fourth of July parade, or any other event where you can express your American pride. Whether portraying the Father of Our Country, the maker of the American flag, Uncle Sam, the Statue of Liberty. 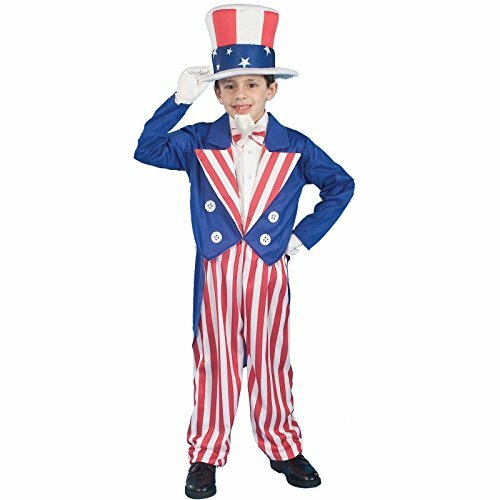 or another patriotic character, kids are bound to love dressing up in the red, white, and blue or other interesting costume choice that represents America and our freedom. 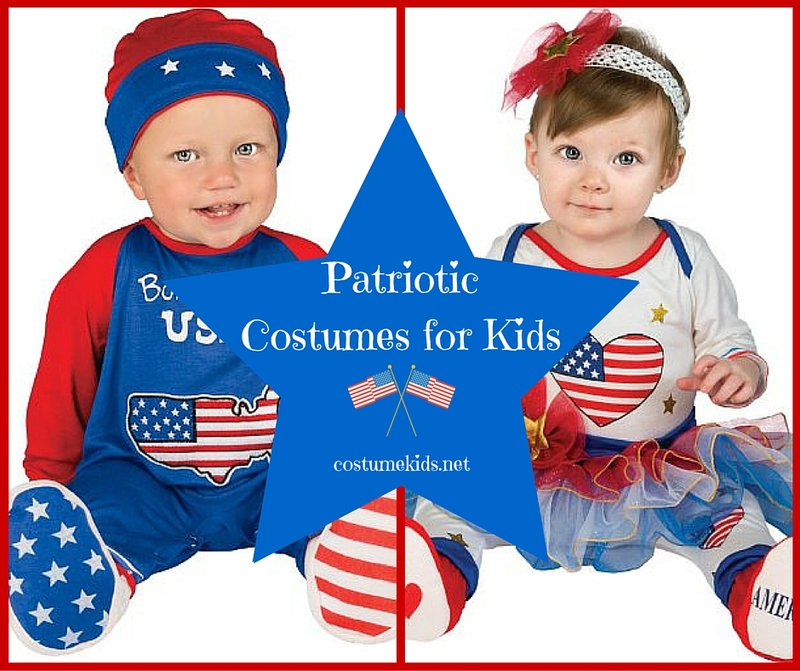 Here we look at some great patriotic costumes for kids that are sure to be a big hit. 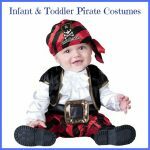 This costume is available in sizes child small and child medium and includes the hat, jacket, pants, and tie. Pair with a white goatee and white gloves (not included) to look just like Uncle Sam. Hat is a top hat style with red and white wide stripes and a band of blue with white stars around it. The jacket is blue with large white buttons and red and white striped on the wide collar. Pants are red and white striped and the tie is solid white in color. This would be a great costume for a school presentation or play about patriotism. Available in sizes small, medium, and large, this Betsy Ross costume is about as patriotic as it gets. Any little girl would love portraying the woman who made the first American flag. 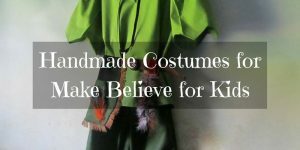 Costume includes cap, dress, and apron. 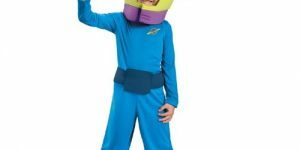 Makes the perfect costume for a school play or presentation, Independence Day celebration, or Halloween. Hat is white and ruffled, dress is floor length and features a red and white bodice with white puffy sleeves. Skirt section is red and white stripes.The apron is blue and has white stars and ties at the waist. 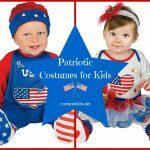 Available in child sizes small, medium, and large, this patriotic costume for kids includes the dress and coordinating tiara. Add the torch (sold separately) for the perfect Lady Liberty look. 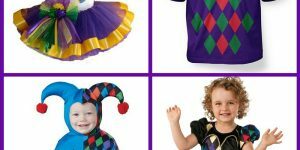 Your little gal will have fun portraying this symbol of America in a green draped dress that comes to the floor, with matching green tiara complete with spikes and windows around the crown. 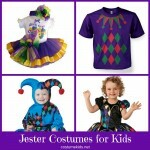 Made from 100% polyester, this outfit includes a printed jumper with attached tutu and matching headpiece and booties. Garment can be hand washed and laid flat to dry. Headband is white with a large red flower with a gold star on it, shirt is white and trimmed in red and blue with a heart in the center. Heart features red and white stripes and a section of blue with white stars. Tutu is red, white, and blue. Booties and red with white bottoms and one bootie says “I love” (with a heart for the word love) while the other bootie says “America”. 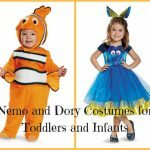 Costume comes in sizes 0 to 6 months and 6 to 12 months. Perfect for Halloween or the Fourth of July dress up fun. 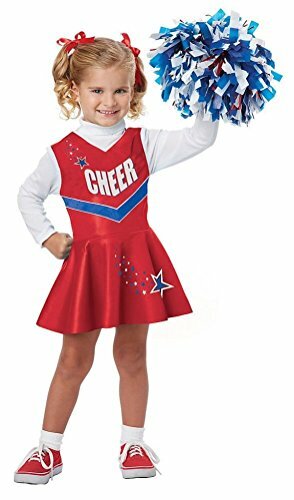 Available in child sizes medium (3 to 4) and large (4 to 6), this costume includes a red cheerleader dress with attached turtleneck and one pom pom. Made from 100% polyester fabric, dress has white sleeves and a red bodice and skirt. Features a blue V shape and the word “CHEER” in white lettering. Blue stars add extra detail. Pom pom is blue and white and coordinates with the dress. 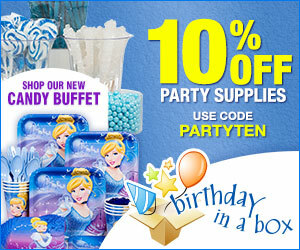 Great for dress up fun. 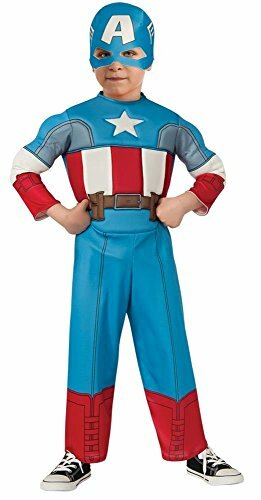 Available in child toddler sizes 1/2, this Captain America costume features a blue padded muscle chest jumpsuit . There are red and white stripes on the chest and front of chest bears a white star. Blue mask has a large white A on it. Combine with the Captain America shield (sold separately) for the perfect patriotic superhero look. 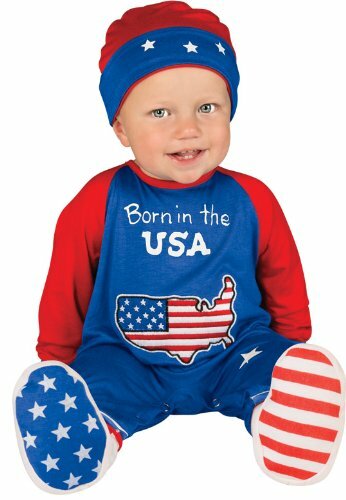 Available in sizes 0 to 6 months and 6 to 12 months, this patriotic costume is made from 100% polyester fabric. 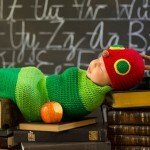 Costume includes jumper, hat, and matching booties. Costume is easy to get on and off for quick diaper changes and can be hand washed and laid flat to dry.Hat is red on top with a blue band around it with white stars. Sleeves of the jumper are red and the bodice and leg sections are blue. Front of chest features the words “Born in the USA” and a map of the United States done in red and white stripes and a section of blue with white stars. Bottom of one bootie is blue with white stars, while the other bootie is red and white striped. 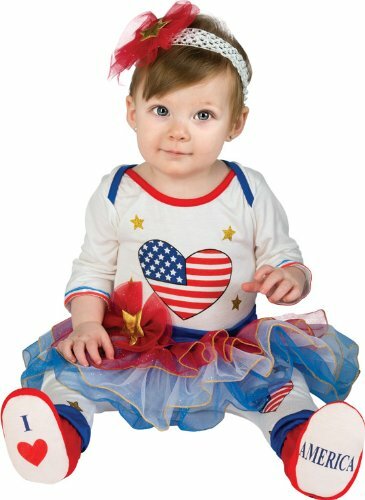 A cute little outfit to wear for Independence Day or Halloween. One of the patriotic costumes little girls will love is this American Dream Girl costume, made from 100% polyester with 5% nylon. American Dream is the daughter of Captain America and shares her father’s sense of red, white, and blue fashion. Available in sizes small (4 to 6X), medium (7 to 8), and large (10 to 12). Garment can be hand washed . Costume includes sparkle dress with attached cape, and cute eye mask. Dress is blue with red cuffs at wrists. A white star is near the neck and comes down to a red and white striped section, ending in a solid blue skirt section. Red cape is attached to the dress. Red cuffs feature white stars. Eye mask is fancy and white. Combine costume with a pair of red boots for a great and authentic look. 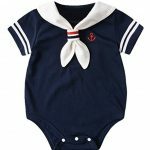 This cute boys’ sailor outfit is available in sizes Toddler 2, Toddler 4, small (4 to 6), medium (8 to 10), and large (12 to 14). 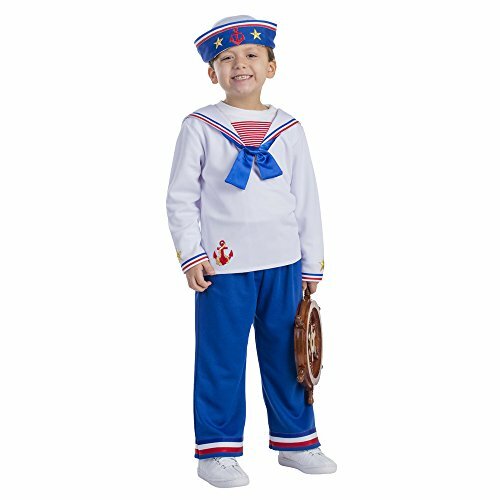 Made from polyester, costume includes white pull on shirt with attached red striped dicky insert and white sailor collar with blue bow, blue pants, and hat. Hat is white with blue band with white stars and a red anchor. 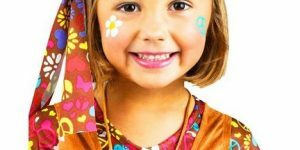 Patriotic costumes for kids are great to use for dress up fun, Halloween, Cosplay, the Fourth of July parade, or any other event where you can express your American pride.